Your biography becomes your biology. The emotional trauma we suffer as children not only shapes our emotional lives as adults, it also affects our physical health, longevity, and overall wellbeing. Scientists now know on a bio-chemical level exactly how parents’ chronic fights, divorce, death in the family, being bullied or hazed, and growing up with a hypercritical, alcoholic, or mentally ill parent can leave permanent, physical “fingerprints” on our brains. When we as children encounter sudden or chronic adversity, excessive stress hormones cause powerful changes in the body, altering our body chemistry. The developing immune system and brain react to this chemical barrage by permanently resetting our stress response to “high,” which in turn can have a devastating impact on our mental and physical health. Donna Jackson Nakazawa shares stories from people who have recognized and overcome their adverse experiences, shows why some children are more immune to stress than others, and explains why women are at particular risk. 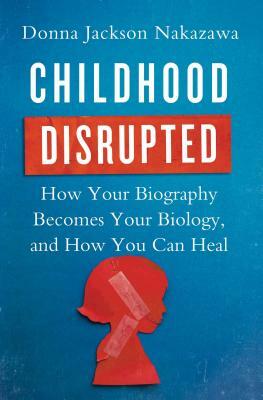 Groundbreaking in its research, inspiring in its clarity, Childhood Disrupted explains how you can reset your biology—and help your loved ones find ways to heal. Donna Jackson Nakazawa is an award-winning science journalist, public speaker, and author of The Last Best Cure, in which she chronicled her yearlong journey to health, and The Autoimmune Epidemic, an investigation into the reasons behind today’s rising rates of autoimmune diseases. She is also a contributor to the Andrew Weil Integrative Medicine Library book Integrative Gastroenterology. Ms. Nakazawa lectures nationwide. Learn more at DonnaJacksonNakazawa.com. "A truly important gift of understanding—illuminates the heartbreaking costs of childhood trauma and like good medicine offers the promising science of healing and prevention." "This groundbreaking book connects the dots between early life trauma and the physical and mental suffering so many live with as adults. Author Donna Jackson Nakazawa fully engages us with fascinating, clearly written science and moving stories from her own and others' struggles with life-changing illness. Childhood Disrupted offers a blend of fresh insight into the impact of trauma and invaluable guidance in turning toward healing!" "Long overdue . . . Childhood Disrupted is a courageous,compassionate and rigorous every-persons guide through the common roots and enduring impact of childhood trauma in each of our lives. Linking breakthrough science with our everyday lived experience, Childhood Disrupted inescapably and artfully leads the reader to take practical steps and grasp the urgency of coming to terms with and taking a stand to heal the legacy of trauma in our personal and collective lives. This book reframes the common experience of childhood trauma through a lens of possibility for a life and society with an inexhaustible commitment to the safe, stable and nurturing relationships our health and healing require." "Donna Jackson Nakazawa’s Childhood Disrupted masterfully captures the complexity of how early life adversity imprints on our biology and stalks our health into adulthood. Heart rending stories of hardship and triumph laced with medical facts and findings creates a framework of practical advice for remaining unbroken in a challenging world." “Donna has once again taken a difficult medical topic and made it not only easy to understand, but a great read. Eye-opening and inspiring, Childhood Disrupted provides a paradigm-shifting road map for understanding how early stress is linked to later illness, and offers a must-read vision for how to begin healing at any age. This book will help readers and especially women better understand the biology of stress, and jump start important new conversations about our health and well-being!" "Childhood Disrupted is a timely book that summarizes the effects of childhood adversity, incorporating the current science in a very personalized and approachable way. The more we understand about childhood adversity and its imprint on our body and brain, the more we can help each other recover from its harmful effects. This is an important read for anyone looking to help those afflicted by childhood adversity, whether personally or in a caring role such as parents, teachers, and health care workers." "Every few years a book comes along that changes the way we view ourselves, our society, and our place in the world. This is such a book. Compulsively readable and deeply moving, Childhood Disrupted contains surprising insights into the power of childhood experience on every page." "In this stimulating book that eloquently describes the effects of one's biography on mind, brain, and body, Nakazawa guides us through a step by step path to recovery. This work represents an invaluable source of hope and inspiration for anyone who is suffering from the aftermath of early adverse experience." "If you want to know why you’ve been married three times. Or why you just can’t stop smoking. Or why the ability to control your drinking is slipping away from you. Or why you have so many physical problems that doctors just can’t seem to help you with. Or why you feel as if there’s no joy in your life even though you’re 'successful' . . . Read Childhood Disrupted, and you’ll learn that the problems you’ve been grappling with in your adult life have their roots in childhood events that you probably didn’t even consider had any bearing on what you’re dealing with now. Donna Jackson Nakazawa does a thorough and outstanding investigation of exactly how your childhood made you ill and/or joyless, and how you can heal." "Childhood Disrupted is a book of major significance that describes clearly and understandably what has been learned in recent years about the important subject of human development and how what happens in childhood affects our well-being, biomedical health,and life expectancy as adults. It will be appreciated by many." — Gerard E. Mullin MD, Associate Professor of Medicine The Johns Hopkins Univ. School of Medicine, author of The Gut Balance Revolution: Boost Your Metabolism, Retore Your Inner Ecology and Lose the Weight for Good! "Nakazawa writes compassionately for readers struggling to make sense of what happened during their childhoods and how their health may be affected . . . [An] engaging work of scientific translation."